Unusual Suspects, is an art exhibition that has roots in power and originality. It showcases 15 artists, whose work has evolved out of a certain amount of artistic isolation from the traditional art world. This path has allowed each of them to develop unique bodies of work with various non-traditional styles and techniques. Laboring throughout a lifetime of heart and soul, all are truly dedicated in achieving a permanent mark with their art on the world. Artist line up includes, Casper, Ish, Risk, Uneek, Zore, Hyde, Tsel, Flash, Kingdom, Pilot, Rooster, Thor, Poem, Traz, Flex. 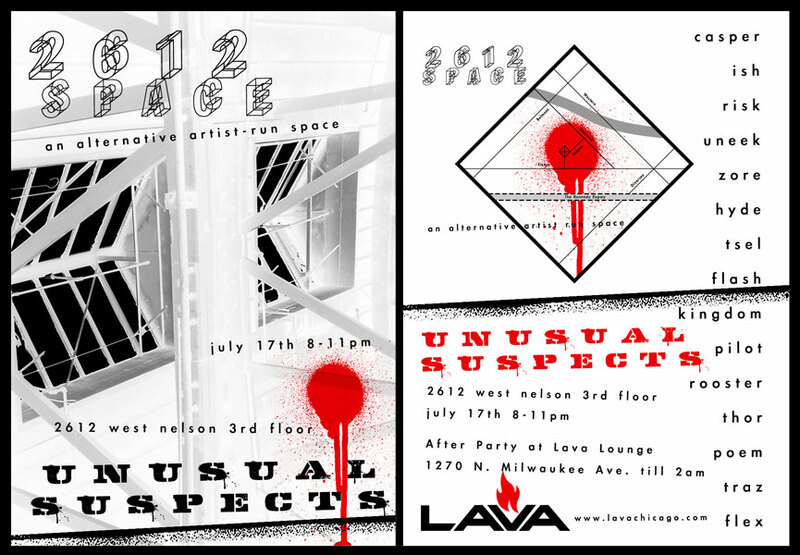 2612 Space is an alternative artist-run space located at 2612 W. Nelson Avenue in Chicago’s “Northwest Nowhere” Industrial-triangle, a corridor bordered by Belmont Avenue, Elston Avenue, and Rockwell Street along the Chicago River North Branch.